Ryan Lochte Apologizes For 'Not Being More Careful And Candid' In Rio : The Torch After the head of the U.S. Olympic Committee issued a formal apology to Rio and Brazil over the U.S. swimmers' behavior, star athlete Ryan Lochte broke his silence over a debunked robbery claim. 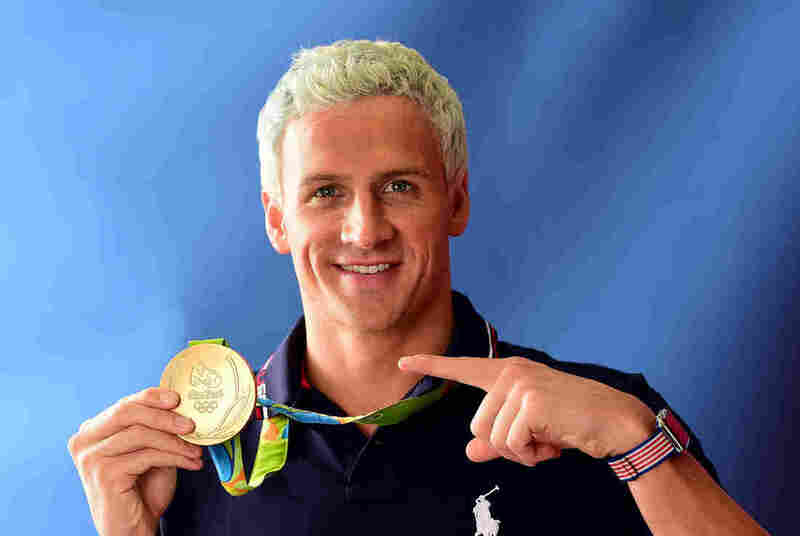 Ryan Lochte poses with his gold medal on the Today show set on Copacabana Beach last week. One day after the head of the U.S. Olympic Committee issued a formal apology to Rio and Brazil over his and others' behavior, swimming star Ryan Lochte says he should have been more careful and candid. "I want to apologize for my behavior last weekend," Lochte wrote on Instagram, "for not being more careful and candid in how I described the events of that early morning and for my role in taking the focus away from the many athletes fulfilling their dreams of participating in the Olympics." The apology comes one day after Rio police said Lochte, 32, fabricated a robbery story in which he claimed a group of armed men posing as police robbed him and three other swimmers as they were returning to the Athletes Village early Sunday morning. "There was no robbery," Rio de Janeiro Civil Police Chief Fernando Veloso said Thursday, announcing the results of a high-profile investigation into Lochte's report that he and three other U.S. swimmers — James Feigen, 26; Gunnar Bentz, 20; and Jack Conger, 21 — had been held up at gunpoint during their time at the Summer Olympics. Of the four, Lochte was the first to leave the country, thus eluding an attempt by police to seize his and Feigen's passports earlier this week. "It's traumatic to be out late with your friends in a foreign country — with a language barrier — and have a stranger point a gun at you and demand money to let you leave, but regardless of the behavior of anyone else that night, I should have been much more responsible in how I handled myself and for that I am sorry to my teammates, my fans, my fellow competitors, my sponsors, and the hosts of this great event." The story has been a complicated one, with many viewing the robbery claim as an inexplicable allegation that made what might have been a molehill — swimmers argue with gas station employees, and no punches are thrown — into a mountain that involved the U.S. diplomatic corps and the publication of security camera footage from both the gas station and the Athletes Village. This video below is a portion of a news segment originally broadcast on Brazil's O Globo, commenting on the incident involving U.S. swimmers at a gas station, as captured on surveillance video. In Brazil, the response to the robbery allegation has been sharp. As of Friday morning, a Google news search for Lochte's name and the Portuguese word mentiroso ("liar") returned nearly 5,800 results. One hour after Lochte posted his statement on Instagram, it had already garnered 6,300 comments. While some of those responses were sympathetic to Lochte, others were not. "Your excuses are more false than your blonde hair," one reads, followed by this summary: "drunk American." Here's another: "It's too late, bro... Damage is done! This marketing speech won't save it... Btw, you were held under gun point to control yourselves 'cause you were all crazy drunk breaking stuff at the gas station! You're the ones who offered money so the gas station employees wouldn't call the police. Don't apologize for a lie lying again." Lochte's statement — which doesn't acknowledge contradictions between the now-accepted version of events and what Lochte's lawyer earlier this week called "a witness statement under oath" that the swimmer gave to police in claiming a robbery — stops well short of the tone struck by other U.S. officials. "The behavior of these athletes is not acceptable," U.S. Olympic Committee CEO Scott Blackmun said late Thursday night. He apologized to "the people of Brazil for this distracting ordeal in the midst of what should rightly be a celebration of excellence." "As we understand it, the four athletes (Bentz, Conger, [James] Feigen and Ryan Lochte) left France House early in the morning of August 14 in a taxi headed to the Olympic Village. They stopped at a gas station to use the restroom, where one of the athletes committed an act of vandalism. An argument ensued between the athletes and two armed gas station security staff, who displayed their weapons, ordered the athletes from their vehicle and demanded the athletes provide a monetary payment. Once the security officials received money from the athletes, the athletes were allowed to leave." While Lochte had already left Rio before police sought him, Bentz and Conger weren't so fortunate. After they were pulled off a U.S.-bound airliner for questioning Wednesday, their passports were seized, and they spent hours at a police station before staying in Brazil for an extra night. After the pair gave testimony about the morning in question, their passports were returned; they left Rio on Thursday, U.S. officials say. As for Feigen, it now seems that he has resolved his legal troubles. Multiple news outlets in Rio are citing Feigen's Brazilian attorney who says the swimmer made an agreement with a Brazilian judge that will see him donate 35,000 reals ($10,800) to a youth sports group in order to settle the issue and allow him to leave the country. After Lochte's statement was published, Rio 2016 spokesman Mario Andrada said Friday, "We obviously accept his apology and appreciate it." "Understand that the Brazilian population was quite disappointed in the actions and the facts," he added, saying that around 1.8 million people had complained about the case on the Rio 2016 Twitter account. Saying "it's clear the Brazilian population felt humiliated by the early part of the issue," Andrada concluded that he thinks people in Brazil "will accept his apologies." When the USOC's Blackmun apologized to the people of Brazil last night, he said that he'll review the matter and consider possible consequences for the athletes. Those consequences might include action by the national governing body. As NPR's Howard Berkes tells us, USA Swimming's code of conduct includes a broad rule concerning athletes' behavior that is "detrimental to the image or reputation of USA Swimming ... or the sport of swimming." Possible punishments for breaking that rule include being kicked out of the federation. USA Swimming and the International Olympic Committee said separately they will investigate the matter, but gave no time frame on how long that might take.